Today’s been filled with Dale Earnhardt, Sr. eulogies honouring the coming tenth anniversary of his death on the final lap of the Daytona 500, on Feb. 18, 2001.The Times laments the inability of a current driver to fill Earnhardt’s iconic void, as NASCAR has begun to seriously flounder after a turn-of-the-century boon. Not to rain on anyone’s parade – Earnhardt, Sr. was undeniably a huge part of the sport’s growth, and is not easily replaceable – but this whole episode stinks of some posthumous oversimplification. 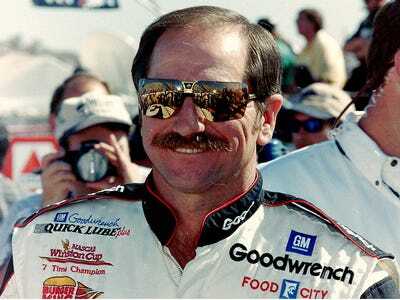 The author argues that there’s no one to fill “The Intimidator” role that Earnhardt so ably embodied during his career. New York Times, meet Kyle Busch. Ah, the Times does mention Busch further down the article, but disqualifies him because he hasn’t won the championships that Earnhardt has. But the list of people who have, is one name long (Richard Petty). And Busch, still just 25, has a promising career in his own right. Plus, if the sport needed a winner to captivate a wider audience, well no need to look past Jimmie Johnson. The guy’s won an unprecedented five consecutive championships. But everyone says Johnson is too vanilla to carry the Earnhardt legacy. Then, of course, there’s Dale Earnhardt, Jr. The Times argues that he was the perfect candidate to fill his father’s racing shoes, until he abruptly stopped winning in 2007. Finally, there’s Jeff Gordon, the Rainbow Warrior. He should fit the bill. He’s been around long enough (this is his 19th season), has been wildly successful (five championships), dates a supermodel (Ingrid Vandebosch), has the sponsorships (Kellogg, Frito-Lay), and isn’t so completely clean-cut as to be labelled bland. But he falls short, according to the Times, of the standard set by Earnhardt, Sr.
It’s like a racecar version of Goldilocks, without a “just right.” Kyle Busch hasn’t won enough, Jimmie Johnson’s won too much, and Jeff Gordon hasn’t, well, what exactly hasn’t he done? If NASCAR is going to pin all its hopes on finding a “just right” reincarnation of Dale Earnhardt, Sr., it’s going to be a long time before it ever matches its once-surging popularity. In fact, the real, live, breathing Earnhardt, Sr. probably couldn’t even meet these insane expectations.